As of 1st September, we have launched Autumn Winter! The new collection is going down really well and the team and I couldn’t be more pleased! As well as a new colour palette and additional styles, we have launched a new womenswear range so you can subtly twin with your kids. As with our childrenswear range, our new women’s pieces are all made in Britain from 100% linen, which gets softer with every wash. In addition to ‘Natural’ returning for AW18/19, we have 4 new colour ways for this season: Caramel, Fig, Mustard and Chocolate- all rich, vibrant shades that work well styled with a neutral colour palette. We especially love Mustard- it’s such a sunny and mood-boosting colour! This is our first linen collection that we have released for women and we have been so excited to put out these new pieces! The shirt and pants in women’s sizes are the same as the childrenswear pieces so you can match with your kids. We love the combination of the Caramel Linen Shirt with the Natural Linen Pants– such a great pairing! The style we have released exclusively for womenswear is the shirt dress- a really flattering piece that suits all body shapes as well as being an absolute classic! Style with ankle boots for a sophisticated day time look. 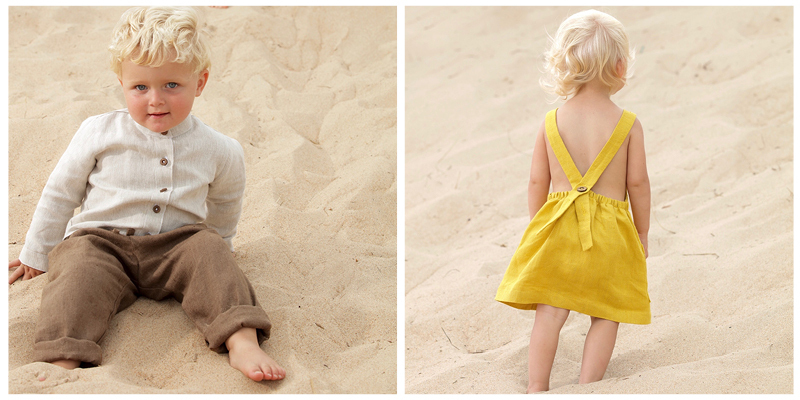 We have three new styles for our Autumn Winter childrenswear collection. Firstly the shirt and pants, both made from 100% linen, which indicate our move to increasing our unisex offering- these two pieces work equally well on girls and boys and means that they can be passed down to siblings and friends of any gender. The shirt is a classic, button-up style and the trousers can be rolled up at the hem which means they can be adjusted according to your child’s growth. Another new style that we have launched this season is the pinafore dress, which features adjustable cross-back straps. This pinafore can be worn all year round- in colder months layer a long-sleeve top or jumper underneath to maximise warmth- we love this new style for girls and hope you do too!